Thanks to my not paying attention in my one semester of college French, a nice France-dweller named Jonathan Miller got in touch with me to chastise me about a mistake I made in my graphic for this post a while back. 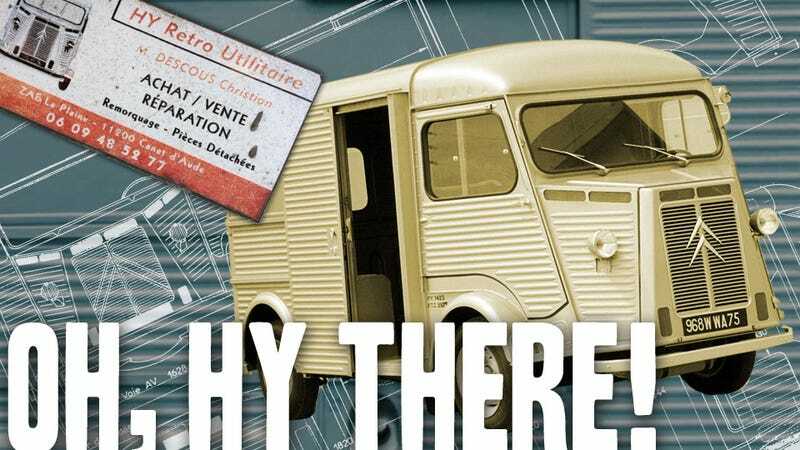 Suitably chastised, Mr.Milller has since given up on the idea I'll ever write even toddler-grade French, and has instead taken many great pictures of some old French iron, including this amazing collection of Citroën H-series vans. The photos were taken at HY Retro Utilitaire, near the village of Canet d'Aude. I don't have absolutely conclusive proof, but it seems quite likely this is the largest collection of HY vans in one place. The vans are charming, crude, and remarkable machines, in many ways the absolute barest essence of a van as a room on wheels. The garden-shed looks come from the ribbed-panel construction (light and strong, and inspired by German Junkers fighter planes), and the vans are built from parts stolen from the Citroën parts bin– 1911cc engine from the Traction Avant and DS, headlights and other electrical bits from the 2CV, and the seats are probably from the factory cafeteria. They were built from 1947-1981 with hardly any changes. Check out the gallery, and enjoy the rusty Frenchness of it all.